Free brain teasers help your brains need for exercise, just like the rest of your body. If you do not use your brain, you are going to lose cognitive function just as you lose muscle if you do not regularly exercise your body. Make a point of doing some form of brain exercise every day. Incorporate free brain teasers into your daily routine and this will boost your memory. 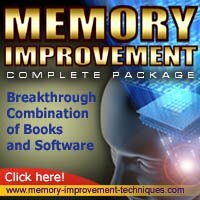 You do not have to invest in some expensive, state-of-the-art program to keep your brain functioning optimally and your memory keen. You can do this yourself, and it does not cost you a thing. Playing games is an ideal free brain teaser to keep your brain and memory functioning at peak capacity. When you are sharp, alert and can actually remember what your spouse or your boss just told you it's going to make life so much easier for you and eliminate a lot of the stress that comes with forgetfulness. Playing cards is a wonderful way to tease your brain. You have to remember what cards have been played or what is trump. You have to think, and you have to remember if you want to win. Get out a deck of cards and play solitaire if you are alone. Recruit some players and engage in a competitive card game. This is a wonderful way to tease and engage your brain and make it work hard. Anytime, you challenge your brain you are investing in its health. For example, do crossword puzzles or word finds. This is an excellent way to get your brain working. Brain teasers can be anything that obliges you to think. Getting up to get your third cup of coffee, which you do every morning at precisely the same time and taking the same path through your house requires little or no thought. You have to step out of your normal routine if you want to jumpstart your brain. When you eat your lunch, put your utensils in your non-preferred hand. If you are right-handed, feed yourself with your left hand. This challenges your brain and your body. If you hold your toothbrush in your right hand, hold it in your left hand. You will be amazed at how much of a challenge something as seemingly insignificant as this can be if you aren't accustomed to using your non-dominate hand. When you depart from your regular way of doing things, you are putting your brain to work. Look up riddles online or get a book of riddles from the library. Riddles challenge your brain and this is something that senior citizens, in particular, need to do.